The mini museum has a wide array of smalls. Those are trinkets from pens to jewelry. A couple of items of note are the space needle pens. Over the years I have found two of them in boxes of junk at sales. Then when the 50th anniversary came around, the guy who had these pens made, pulled all his unsold stock out of his basement. I bought two brand new ones right from the old store card. Another odd item is the Space Race pin. In Federal Way, Washington there used to be a little amusement park. It was an indoor mini Bavarian town and Christmas was one of their names to fame. They ran a space race promotion during the Worlds Fair and some child won this little pin. Talk about unusual. But in the case of this banner, the sale had no line. I was there early on the first day to get my best shot at it. Not sure why there was no line but I walked in the door and asked about the banner. There it was on the wall in the hall. I grabbed it so fast your head would spin. It is in great shape and measures 36″ x 41″ with 2 1/2″ gold fringe. The family bought it at the fair and must have stored it in a dry place most of its life. The color is still fresh and there is only slight water damage. You have to look close to find that stain. Lastly, here is a close up of the makers mark. 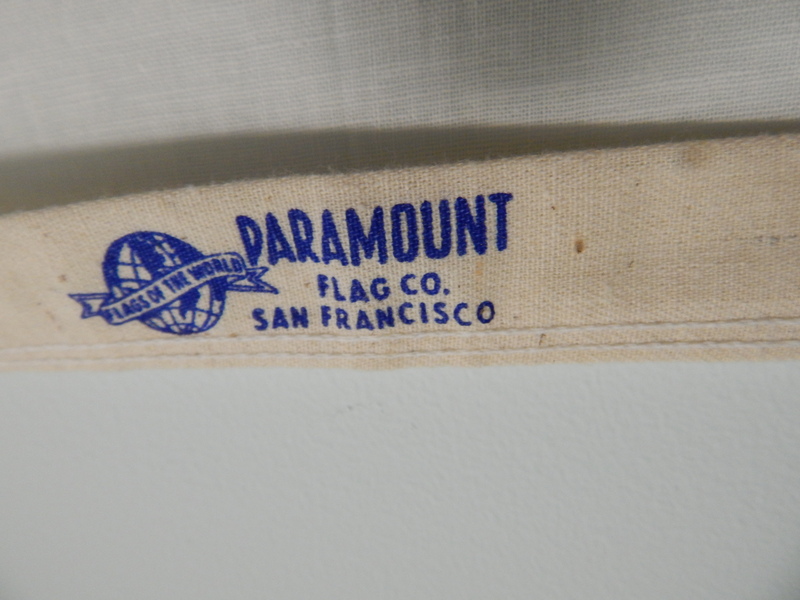 Paramount Flag Company from San Francisco made this as part of their Flags of the World. The company was sold in 1988 to Doublet. This company is also famous for the Rainbow Flag creation.